(subject unknown , circa. 1540). Antonio Neri's mother, Dianora Parenti, was the oldest of six children: three girls and three boys. She was born in Florence, on 11 February 1552, with the given name of Dora listed in the city's baptistery register. In all probability by the age of eighteen she was quite accustomed to helping her mother with the other children; Caterina, the youngest, was born less than a year before Dianora's wedding. Her father and grandfather were prominent lawyers; together they handled much of the personal business of famed artist Michelangelo. 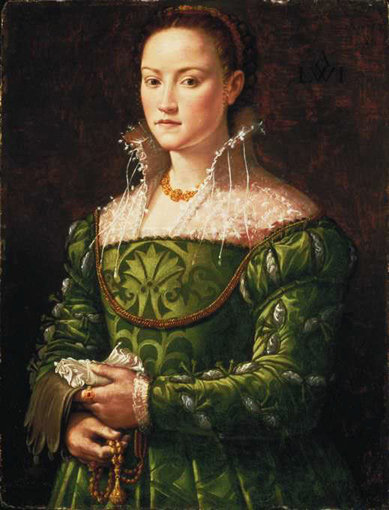 On the 20th day of August 1570, Francesco Parenti walked his eldest child down the aisle to be joined, in holy matrimony, to physician Neri Neri. Two years later, their first child Lessandra was born. Historians Luigi Zecchin and Enzo Settesoldi identified four of Antonio's brothers, two older and two younger. They were Jacopo (1573), Francesco (1575), a second Jacopo (1577) and Vincenzio (1579). In addition to these five boys, there were at least two more brothers born later, Emilio (1583) and Alessandro (1587). And there were at least three girls, the first-born child Lessandra (1572) and two younger sisters: Maria (1581) and Lucretia (1584). In all, there were ten births by Dianora recorded in Florence, occurring almost like clockwork on a fifteen-month schedule. As did many women of the period, she spent a significant portion of her adult life pregnant. In her case, it was a span of sixteen years, carrying one child after another with minimal interruption. The birth of a child in Renaissance Florence was no small occasion. Patrician families went to considerable expense on decorations, on food and drink for guests and on gifts for the mother and godparents. "The woman who gave birth, like a bride at her wedding, occupied for a passing moment a position of unparalleled honor,"* more than that, while a wedding signaled the transition from daughter to wife, the birth celebration was a rare social recognition of a woman as an individual. A genealogical record of the eighteenth century, held at the State Archives in Florence (ASF), confirms most of the Neri children's births. It also sets the date of death for their mother Dianora at 1594 when she would have been forty-two years old. This means Antonio lost his mother when he was eighteen and his youngest brother Alessandro was a mere seven. * Margaret L. King, Women of the Renaissance (Chicago: University of Chicago Press, 1991), p. 4.